We did it! Brent and I have been talking about doing this traverse for many a moon and we finally got it done. 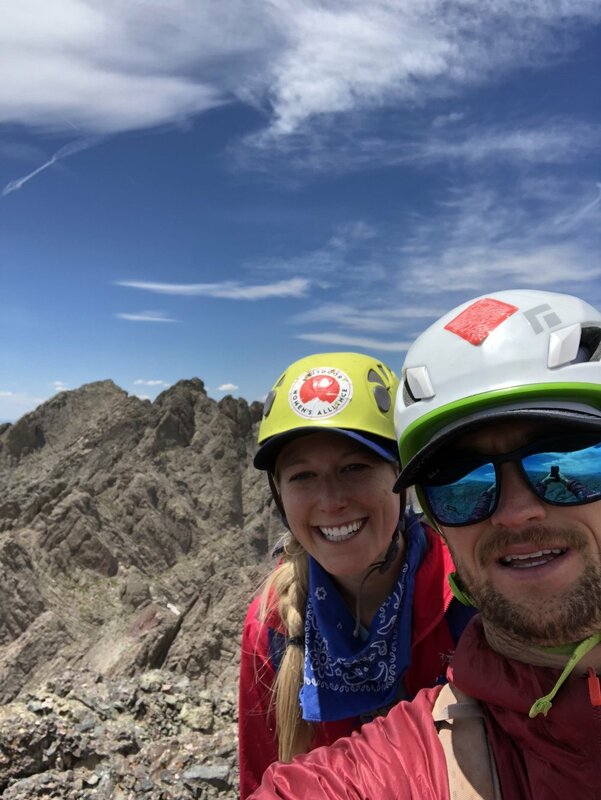 I had already summitted both Crestone Peak and Crestone Needle seperately, but the traverse seemed worth going back for. These sister peaks are really special mountains in their own right and doing the traverse between them is some pretty stellar mountaineering. Let's break it down. 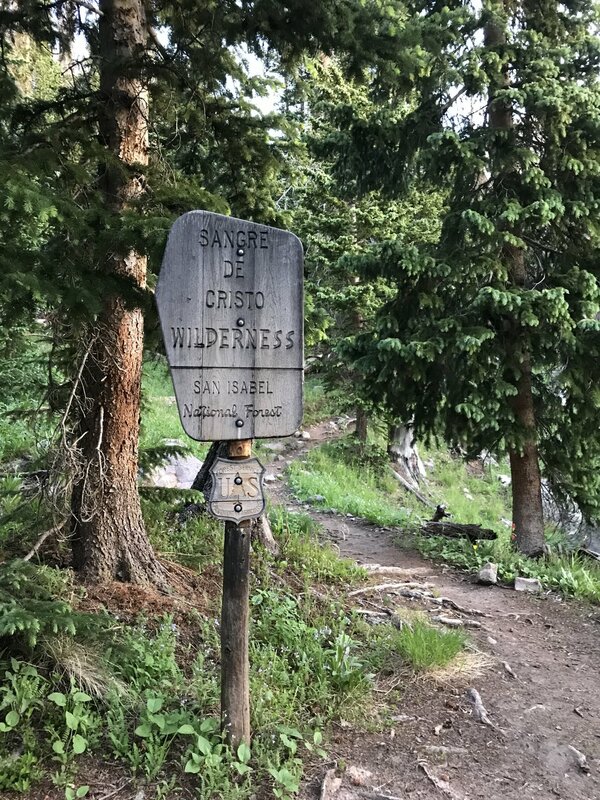 There are two trailheads for the Crestones, I have used the South Colony Lakes trailhead just outside of Westcliff both times I climbed these mountains. It's a very busy trailhead with lots of backpackers and day hikers, but the mountains themselves are not very crowded. This is probably because they are hard. Summitting either Peak or Needle requires some class 4 scrambling and a good amount of elevation gain, so they are not easy walkups that attract a big crowd of hikers. 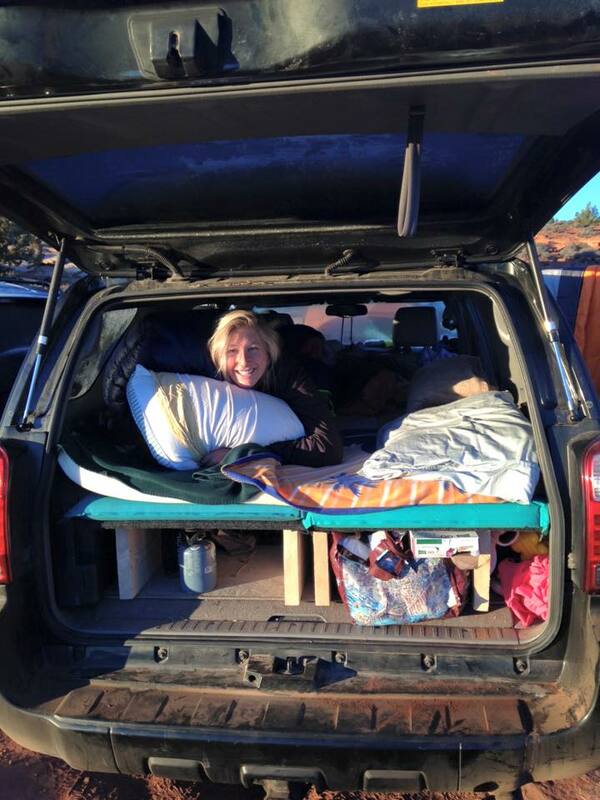 There are two trailheads, a 2 wheel drive TH that is about 15 minutes outside of Westcliff, and the 4 WD TH which is another 20-30 minute drive up a pretty rugged road. If you have a car with decent clearance you should be fine. Honestly, the idea of walking down that portion of the road after climbing the mountains makes me want to cry, so take a car that can make it up to the higher TH. It's basically a luxury queen sized bed and I love it. Highly appreciated when you have a 3:30am wake-up call. Yup we woke up at 3:30 and were on the trail by 3:50. My skincare routine was cut a little short. You hike up a road that used to allow cars to go all the way up to the lakes for camping, which has been closed for many years. Then you meander through the woods for a bit right around tree line where the lakes are. Then you take a left to head up Broken Hand Pass and start gaining your real elevation. You do some class 3 scrambling to get to the top of the pass, it's pretty easy going up, but coming down this section was very difficult for me. I hate coming down things because I am not coordinated and fall really easily. Seriously. And this pass has loose gravel and rock and is really really steep, so basically it takes me longer to get down than get up and I try not to cry the whole time. The fact that my legs were exhausted didn't help. On the other hand, Brent LITERALLY ran down and called his mom while he waited for me. Eye roll emoji. So if you don't know why I am complaining about coming down the pass being hard, neither does Brent. First light hitting Crestone Needle as we hike past one of South Colony Lakes. I did not feel well this morning. My stomach was upset the day before but I thought it was just from too much coffee or something. We ate Chipotle on the way there and I felt okay, definitely not great though. Let's just say that Chipotle stuck around a longggggg time. Honestly, a good morning BM is essential to a good climbing day for me. I did not get that. All day I was on the brink of throwing up anytime my heart rate would rise. So I was moving slower than normal. Brent thinks I was moving slower than anyone has ever moved before, but I was actually staying pretty close to on pace for 1,000 feet of gain per hour which is my usual mountaineering pace so I think I did great. We reached the top of Broken Hand Pass (does not look like a hand) and headed down the other side. If you are only climbing Needle, this is where you turn right to begin climbing up to the ridge of Needle. To get to Peak, you have to hike back down the other side of Broken Hand, walk through a valley next to Cottonwood Lake. You turn right at the bottom of the pass following the obvious trail and hike past the base of Needle to get to Peak. The trail is really obvious until you get to the base of the Red Gully on Peak and then, just follow the Red Brick Road up to the top of Peak! The Red Gully is steep all the way up. 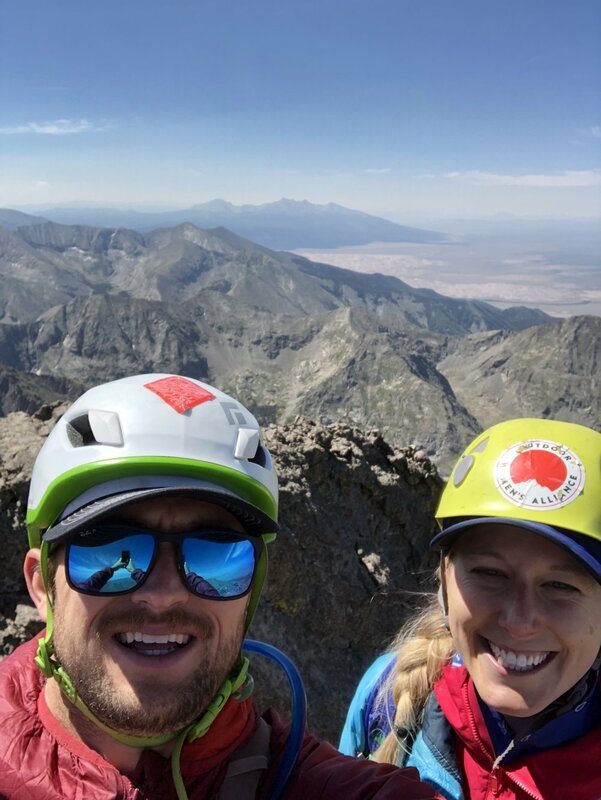 On either mountain, but especially Peak, you want to wear a climbing helmet because climbers above you can knock rocks loose pretty easily. We yelled rock more than once on this climb and were trying to be very careful. If you are not familiar with this etiquette, if you ever knock a rock loose on a climb or scramble, yell (and I mean yell) "ROCK" to the space below you. Even if you are certain no one is below you, you actually can't be completely sure and it's a good habit to get into. Once you get to the top of the gully, you turn left and do some class 4 scrambling to summit Peak. It's a really impressive summit! A small summit in comparison to a lot of 14ers you really get some exposure and an increddddddible view of the sand dunes to the south. It makes them look like a sand box. Okay nice, you have summited Peak, if you are on pace with me it is 10:00am and your work has just begun. Brent forced me to eat my PBJ sandwich which I wanted to chuck of the side of the mountain and drink water. Can you see the Sand Dunes behind us? We left the summit at 10:25 to descend about 700 feet and turn left for the traverse. If you plan on doing the traverse, look for the cairn marking the turnoff on your way up so you will find it easily on the way down. It's not hard to spot. On top of Peak with Needle behind us just above my head and a good view of the traverse. At the turn-off, Brent and I checked in. Do we feel confident? How's the weather? Is my stomach affecting my ability to climb? What time is it? Before beginning any big objective, always check in with yourself and your partner. I didn't feel well but I knew I could do it and I didn't think my stomach would affect my safety. The weather was great with just gusts of wind and no clouds, and our time wasn't bad. We pushed on. Note to self, if your stomach hurts and you're not eating enough, you will bonk and that is incredibly unsafe. Luckily Brent noticed when I started to lose it, almost to the end of the traverse but before the most dangerous part, and made me sit down and eat and drink. Always keep an eye on your climbing partner because if they do bonk (bonking means your blood sugar drops and you aren't thinking straight) they won't have the wherewhithall to handle it because they are bonking. Climbing exposed class 5 while bonking is an absolute no. Sit down, eat, drink, rest, collect yourself and then continue when you feel better. We found the traverse to be easily navigated with the pictures on the traverse route on 14ers.com and the cairns to be clear- so route finding wasn't an issue for us. There is a lot of class 4-5 scrambling so if you are not extremely comfortable on that kind of climbing, I don't recommend attempting this traverse. The climbing is never hard, but, like all mountains, the Crestones are falling down and you need to test every hand and foot before weighting it. The Crestones are made of composite rock, meaning there are chunks of small rocks held together by rock similar to concrete. This creates lots of knobs as holds but I would say about half of all those rocks are ready to go. Just kicking them a couple times will set them free to a new home about 4 thousand feet below. Go slowly, don't trust something until you have tested it. We both wore our 5.10 Guide approach shoes and they were perfect. Our feet definitely hurt at the end of the day since they aren't a true hiking shoe but they absolutely made the traverse safer and easier. The headwall is the crux of the traverse. It's at the very end right before you summit Needle and the exposure is awesome! You are climbing strait up with the valley floor under you to your left. We didn't get any pictures that really captured the exposure because we were being very cautious. If you fell here you would without a doubt not be going home. That said, it was super fun easy climbing and that extreme exposure only lasts for a bit and then you are on top of Needle! I think we summitted around 1:00 so the traverse took us about 3 hours. A quick pic on Needle and down we went. Can you tell how tired I am at this point? Pro tip, make sure you print or download the directions to get off of Needle because it's easy to go down the wrong gully or miss the turn to get back to the top of Broken Hand Pass. From Needle it's all downhill, very steep downhill for quite a while. It's a long way back. I never realize how far I have come on a mountaineering day until I have to walk allllll the way back to the car. We didn't get back until 6:00 pm so this was a 16 hour day for us. I think Brent could have done it in 12-13 hours if he didn't have to wait on me. I think there's a country song about that.